It occurred to me this morning that my lettuce won’t be ready for weeks but there’s no problem at all in filling the daily salad bowl. After years of practicing semi-permaculture and using the results in the kitchen I have strong opinions about salad greens, so I thought it might be worthwhile to go through the ones that I use most. Major greens: these make up the bulk of the salad. The picture above is blue mustard, one of my very favorites. It makes up about half of the bulk of any salad in our household this time of year. 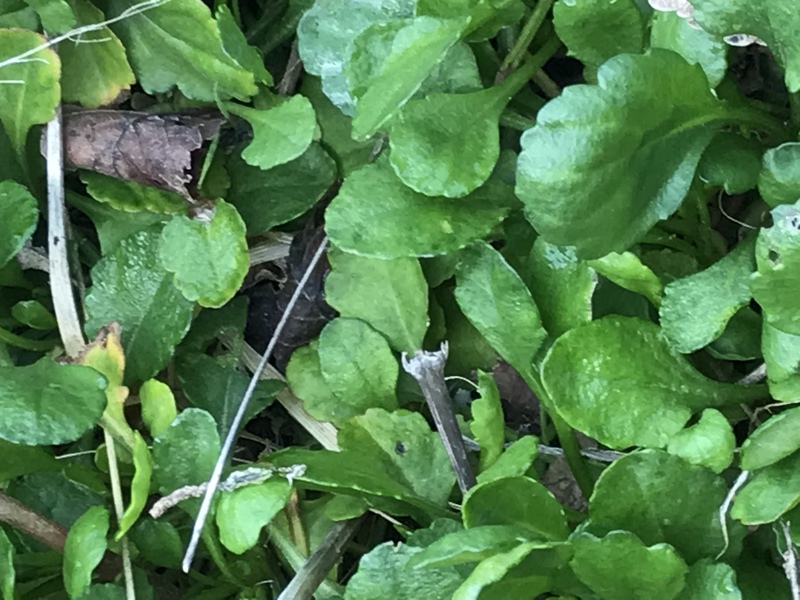 I wrote about it at more length in my previous post, so what I will say here is that it is a recent invader in my area. 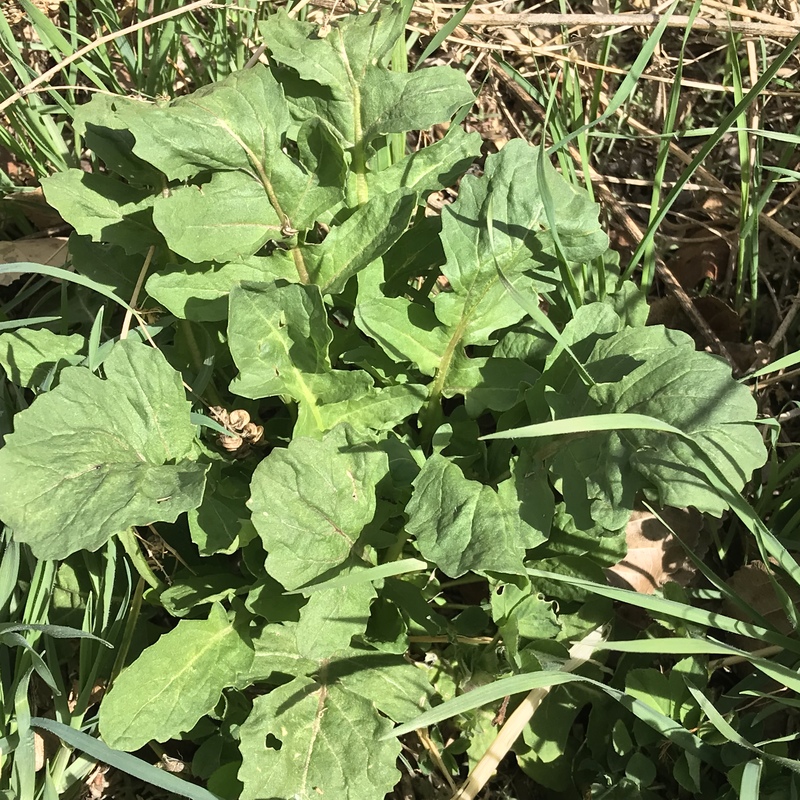 It first showed up along the ditch banks about four years ago, and now it is a common “weed“ in my yard. I have no idea where it came from, but I’m glad it’s here. Get it young, before you notice the tiny blue blooms, and I usually harvest with scissors, cutting about 2 inches off the top of the thick clumps. 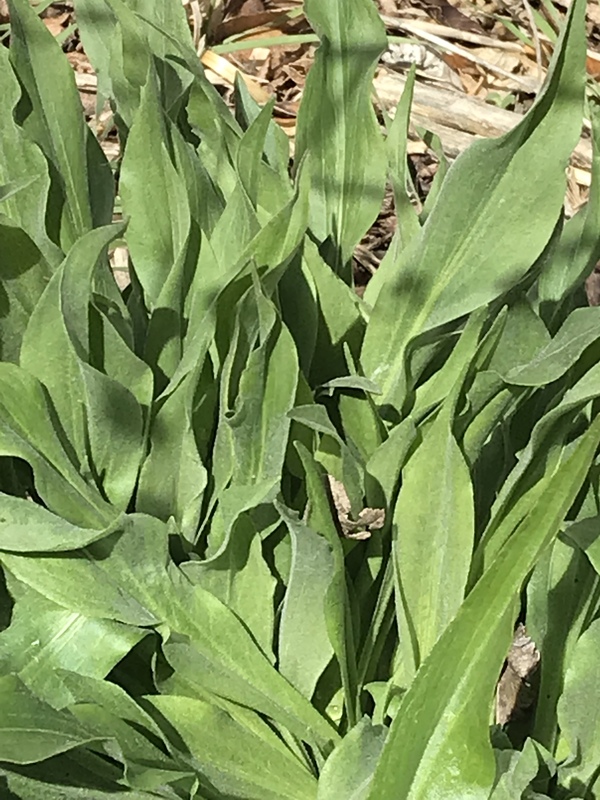 The second bulk green right now is scorzonera. 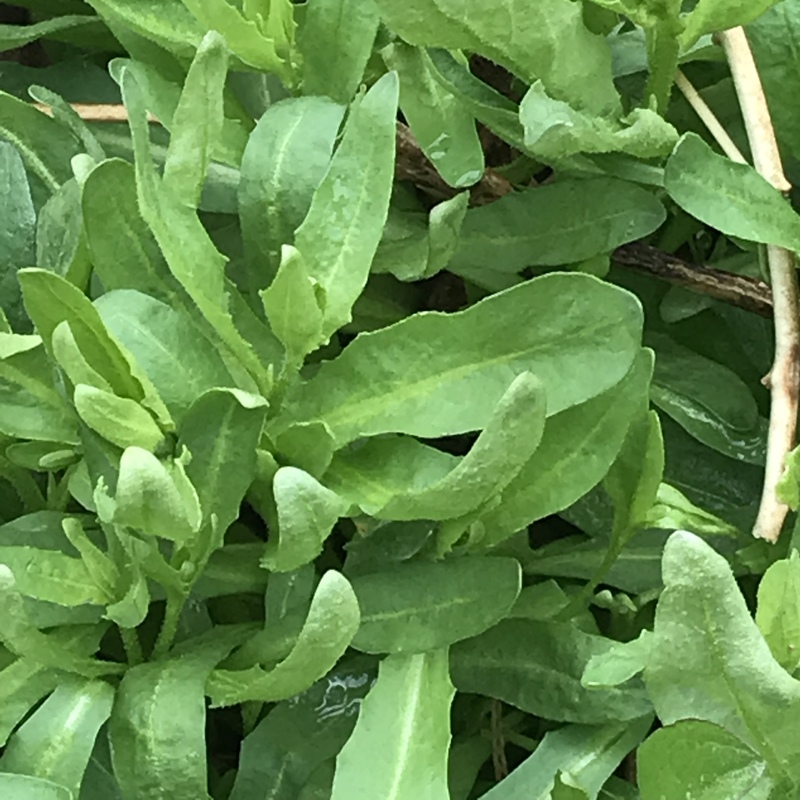 I have written about it elsewhere, so all I will say here is that although it is often grown for the root, I find the root not worth the trouble, but the spring leaves are mild,crunchy, tender, and excellent to make up the majority of the salad mix. 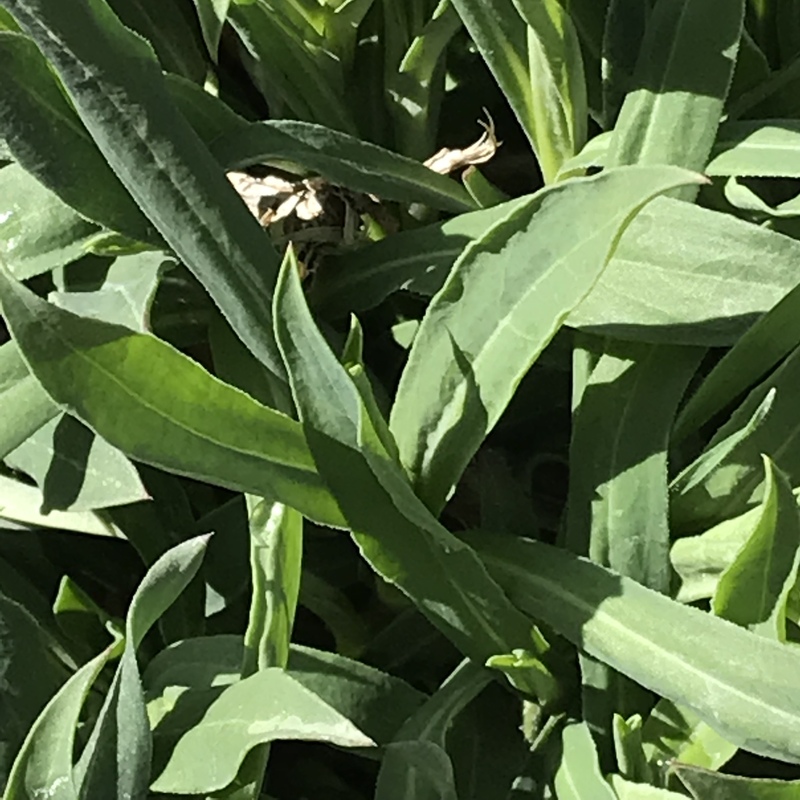 The bloomscapes that come up a little later, harvested before the buds swell too much, are among my very favorite vegetables, so at this stage I harvest individual leaves to make sure I don’t hurt any potential scapes. Take the wider upper half of the leaf, and leave the long stringy stem bit where it is. it takes a few years for scorzonera to establish and make nice full clumps. I advise against cutting it at all the first or second year. My third bulk green right now is bladder campion. It took me a few years to get this one established, but now it is a thriving weed and comes up everywhere. The roots are deep and tenacious, so be sure to pull the roots out if you do want to get rid of it. I pull it out of my raised beds but let it romp away everywhere else. Cut off the top 2” and discard any bare stems. During the summer it is weedy and flops all over other plants, to their detriment, so you have to whack at it a bit. But it is always my first green of spring and the last one of fall, so I would never want to be without it. I have heard the taste of the young sprigs described as “exactly like green peas.” I beg to differ. They do have a hint of green-pea flavor but they aren’t sweet and do have an undertone of faint bitterness. I find them delicious, and they are mild enough to go with anything else. Minor greens:delicious when used in smaller quantities. 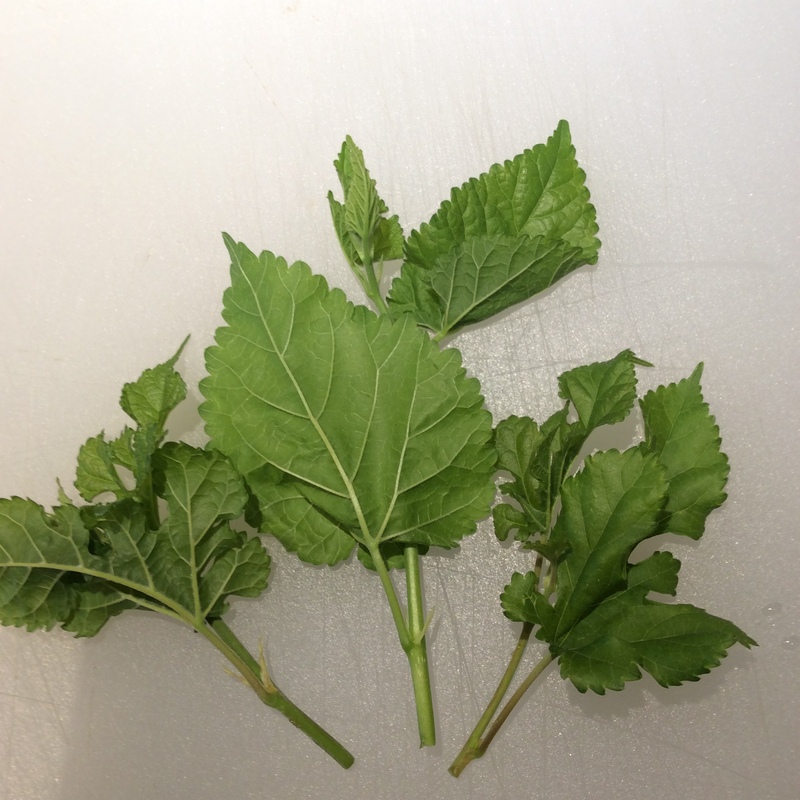 Sow thistle has thick leaves with an intensely green flavor. In some soils I’m told that it’s bitter at all stages, but in my yard it’s mild when young. I don’t have much of it, but enjoy what I have. 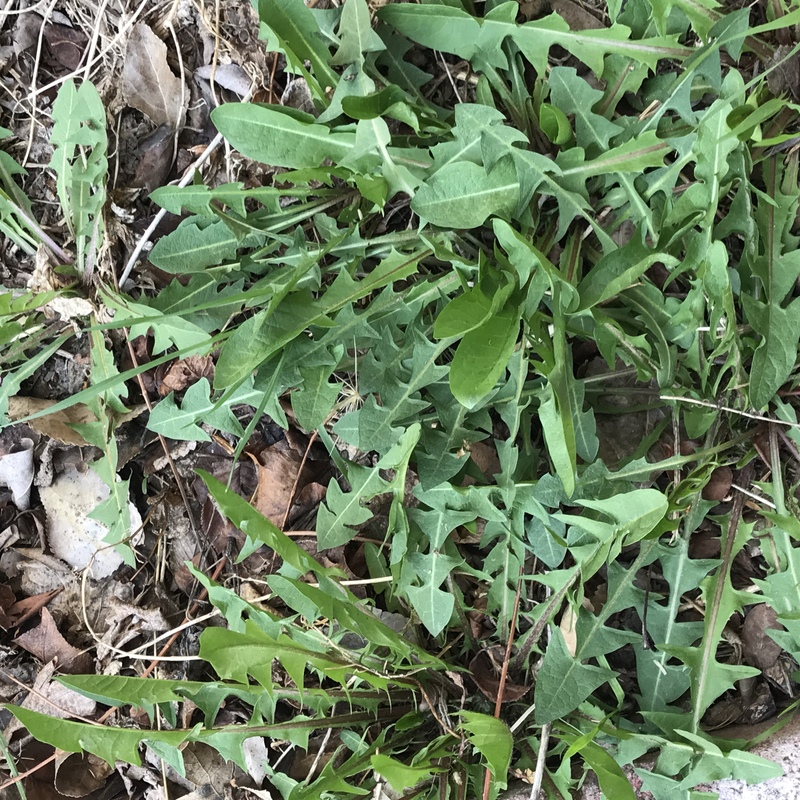 Arugula has been allowed to self-seed in my yard for so long that it’s now a common weed. I throw leaves in the rosette stage into salad, and any that get past me produce small white flowers that bees adore. Alfalfa is nobody’s idea of an edible, apparently, but I like a couple of sprigs per serving. I pinch off the top rosette when the first shoots are about 4” high. Only the first growth of early spring is suitable for this use, and no stems. Oxeye daisy delights the bees when it blooms, and the earliest spring shoots delight me in salads. They are tender, sprightly, and vaguely sorrel-like in flavor. I would eat a lot more of them if I had more. I’m putting in a larger patch this spring. I use dandelions in limited amounts, maybe 10% of the total salad, but I miss them when they aren’t there. Once or twice a season I eat a big salad of pure dandy greens with a garlicky dressing and a side of bacon, but I don’t often have the materials available. Believe it or not, dandelions aren’t common in my area, and the eight plants that I have were started from seed and fussed over like orchids. I let them go to seed, and hope that eventually my yard will be colonized and I can eat dandy salads whenever I crave them. Pea greens are a delicious tender green that really does taste like green peas. 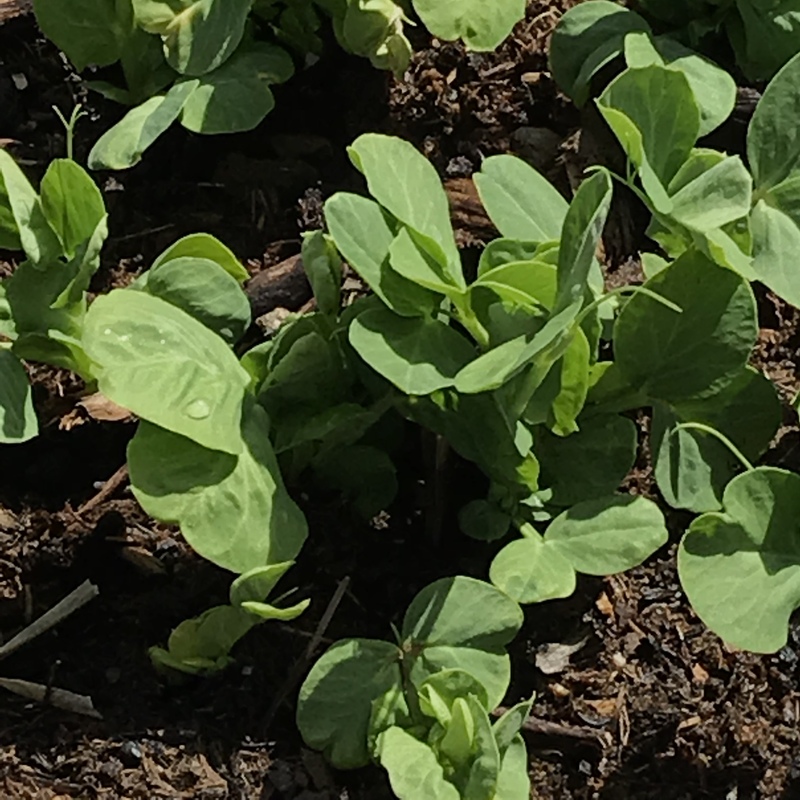 I plant my peas very thickly, almost touching in the furrow, and then harvest about half for spring salads, leaving the rest to grow and bear. Seasonings: these have more distinctive flavors. Don’t be too timid with them though, because the dressing is going to mute them quite a bit. 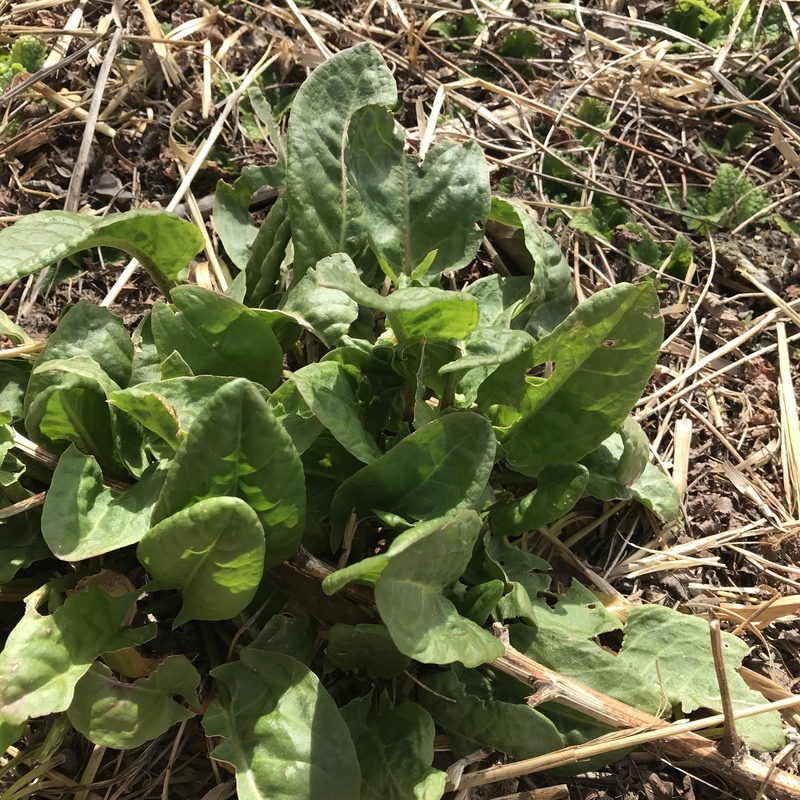 I grow the sorrel variety called “Perpetual,” which doesn’t go to seed. 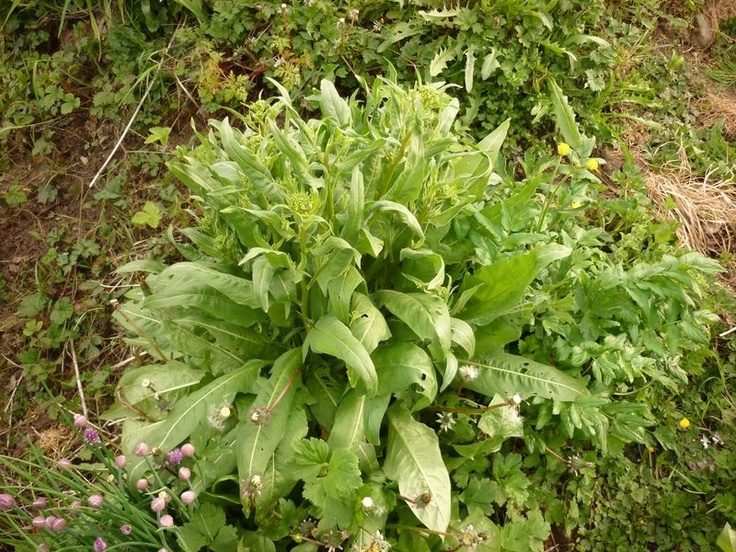 It has the zingy lemony taste of garden sorrel but has thicker, more tender leaves and is a much smaller, less robust plant. I definitely need more plants of this one. 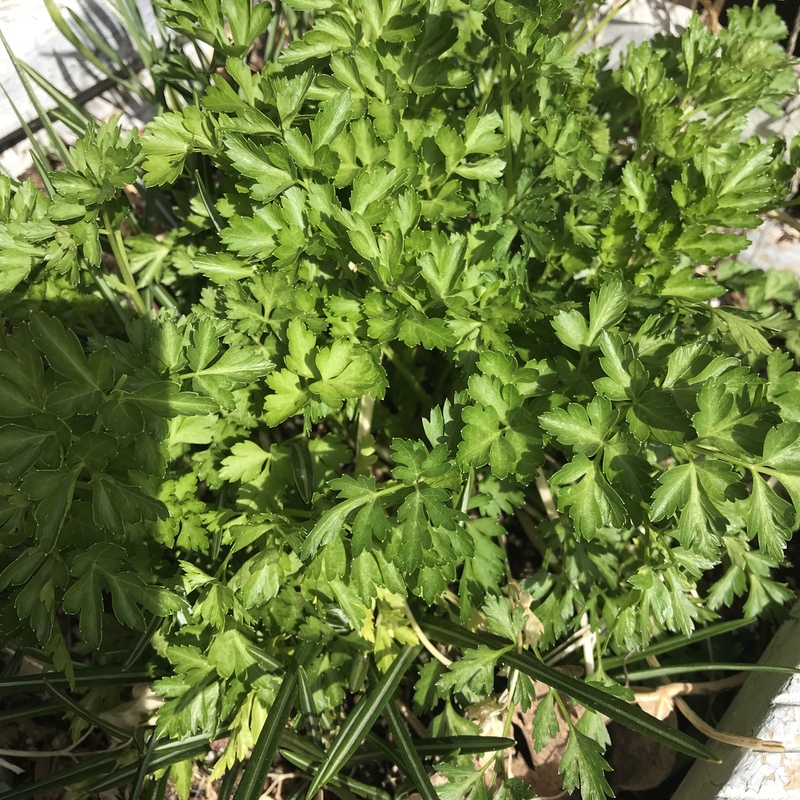 I grow parsley in a semi-permaculture fashion. Planted in spring, I use it all summer and leave it in place in winter. 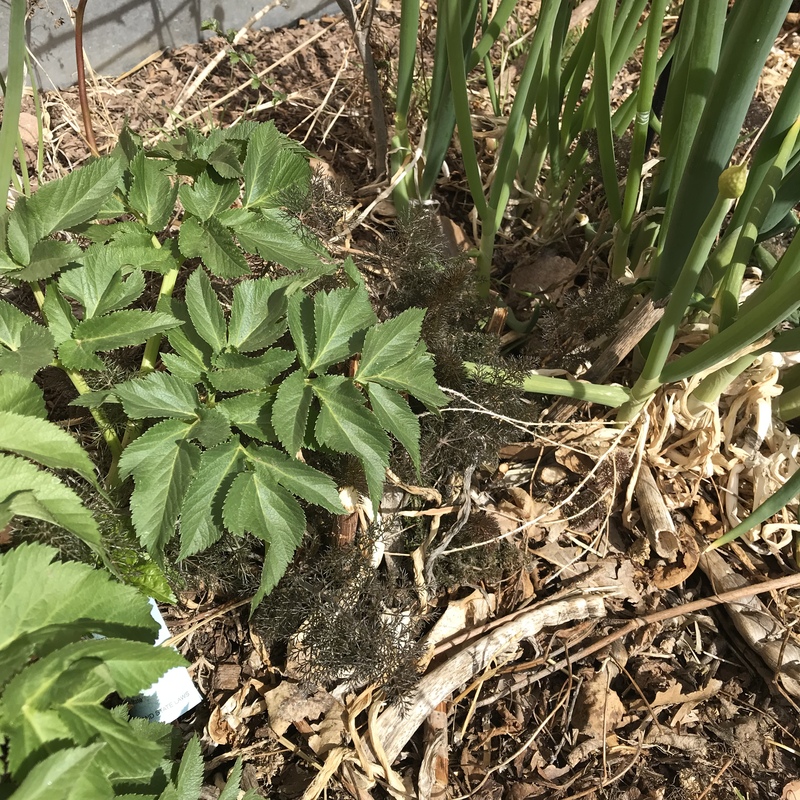 The following spring I get lovely bunches of early leaves to chop over salad and other stuff, and then it shoots to seed and reseeds itself. This photo has three of my favorites. To the right are perennial green onions, which I have written about so much that here I’ll just remind you to sliver some into salads. In the center are young shoots of bronze fennel. Later in the year I would chop them up, but at this stage they’re so mild that I just cut each small leaf in 2-3 pieces. To the left is the first spring growth of Angelica archangelica, which I haven’t used until this year. The first tender leaves of spring have strong notes of celery and juniper. I tear them into pieces about an inch across. When they start to get tough, the stems chopped in thin cross-section will give a similar effect. 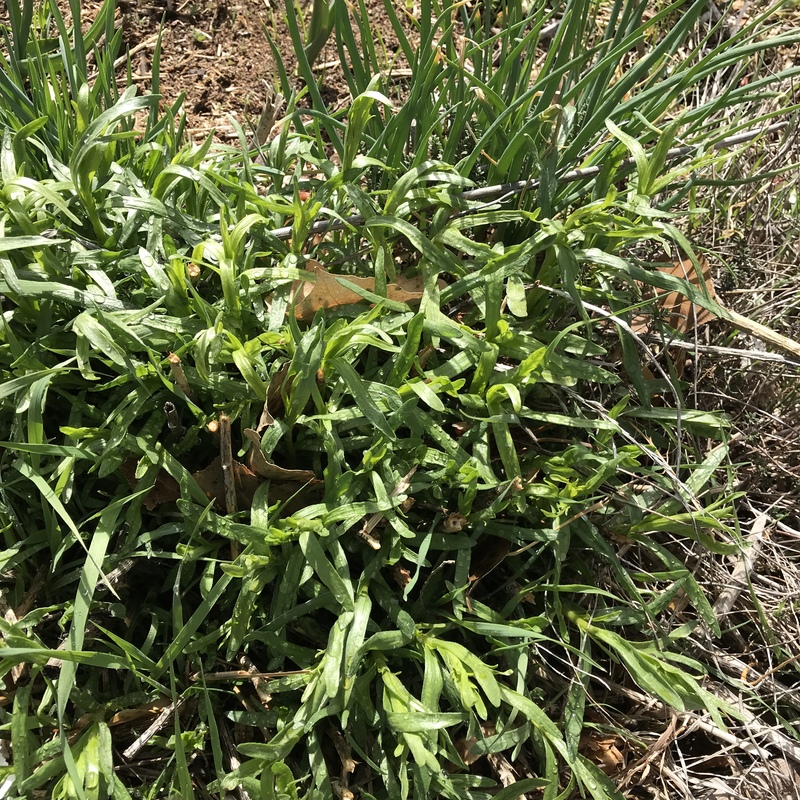 The earliest shoots of French Tarragon add a lovely anise flavor. I pull the new sprigs into individual leaves and toss them in whole. I have heard people say that each dish or salad should contain only one herb, so as not to “muddy” the flavors. I couldn’t disagree more, and have seldom made a spring salad that didn’t contain at least three. Chopped finely the flavors can muddle up and become undistinguished, but left in large distinct pieces as I use them, they are vivid and impressionistic on the tongue. When dinner needs to be quick and light, the staples that you have available become crucial. 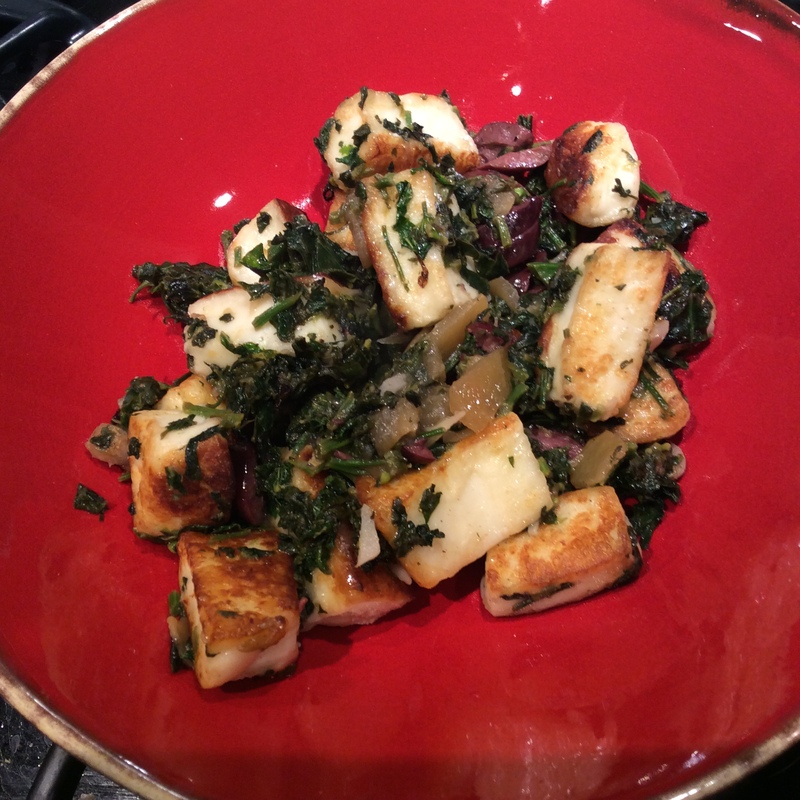 On a recent evening I decided to build a light meal around the goat halloumi that I always have in the freezer. 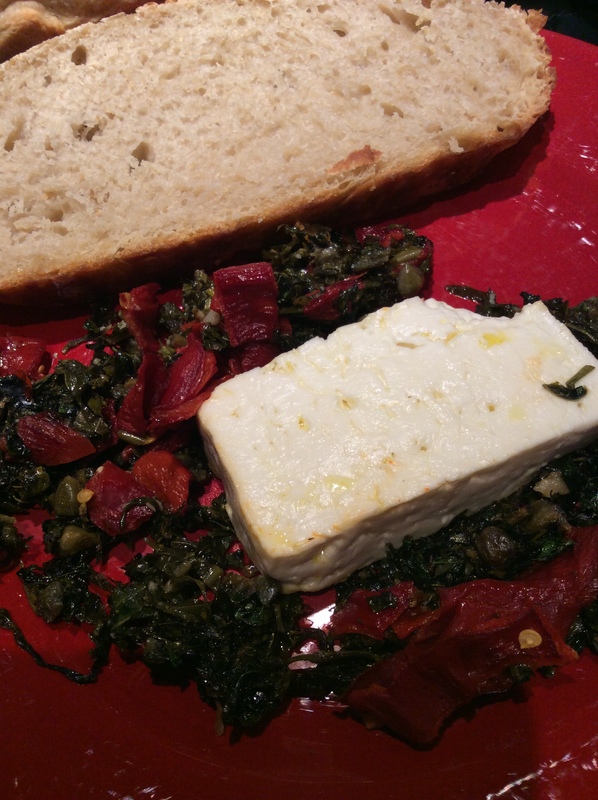 It comes from my beloved Sanaan doe Magnolia, and since she is entirely greens-fed, this dish could be called “greens, direct and indirect.” If you aren’t lucky enough to have a pet goat, the superb halloumi from Mount Vikos is widely available and is great to have in the freezer. Two flavorings that I always have on hand are preserved lemons (very easy to make yourself) and pitted kalamata olives. For 10oz of halloumi, I chopped a small handful each of olives and lemon rind, leaving them fairly coarse. Out of the garden, I grabbed a few stems of thyme, a small bunch of lambsquarters, and a few tender mulberry shoots. The halloumi was fried in a little avocado oil, my current favorite for searing and other high-heat cooking. Meanwhile, I chopped the other ingredients. My lemons are preserved in salt and fresh lemon juice, and I left the juice clinging to them, to season the dish. 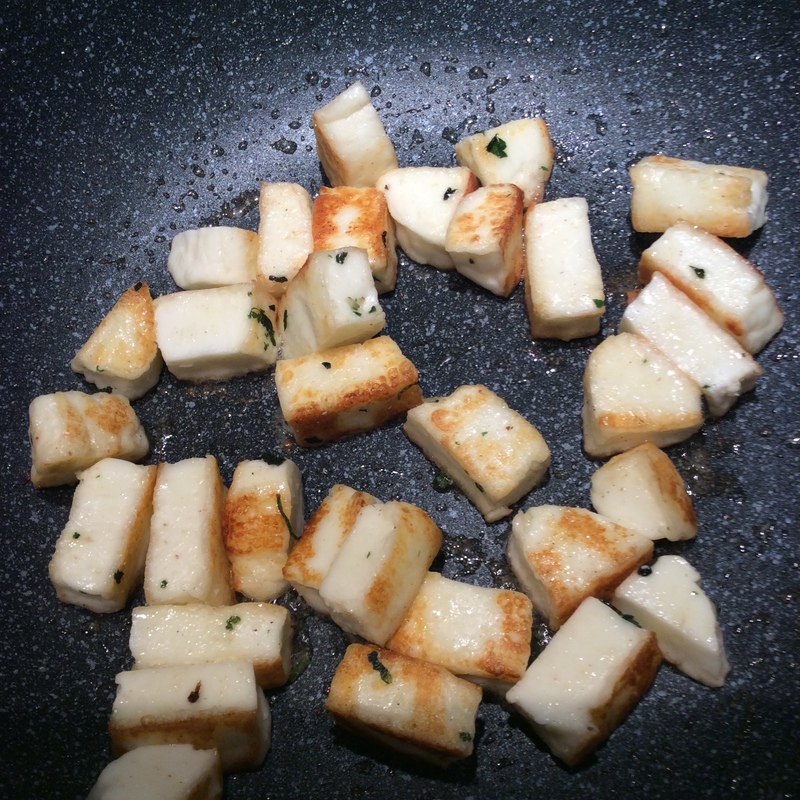 While the halloumi seared, I fried the other ingredients at lower heat in a little olive oil in another saucepan. 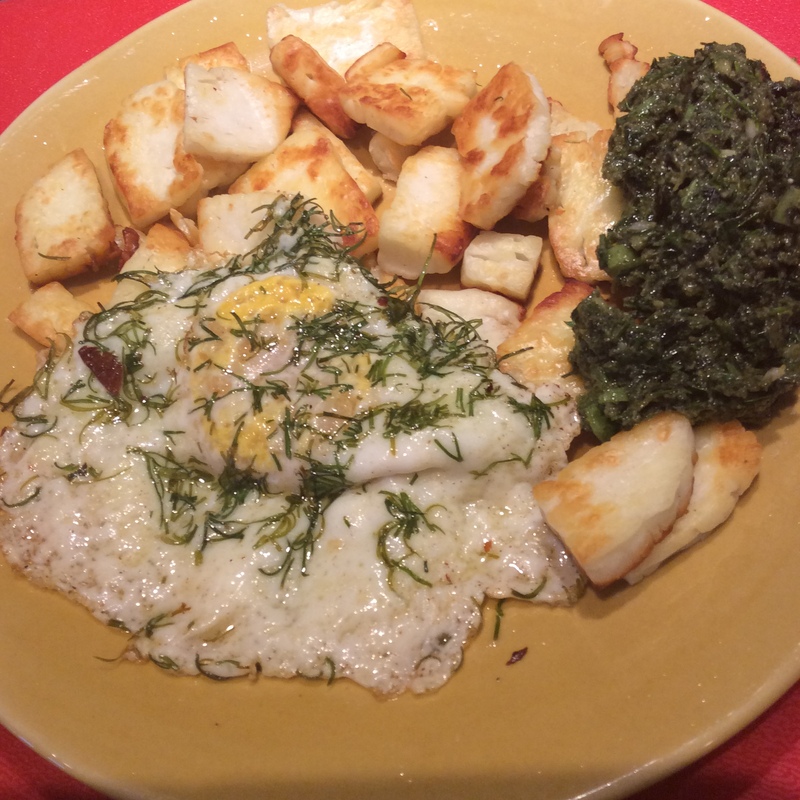 When the halloumi was ready, I tossed it with the seasonings and served. The whole process took just over ten minutes. If you’re hungrier than we were, you can put a slice of sourdough bread drizzled with good olive oil alongside. The point here is that you can feed yourself well and in a very healthy fashion even if all you have time for is quick, improvisational cooking. Keep a few staple flavorings that you like in the refrigerator, and buy a few fresh herbs when you shop so that you can lift quick dishes out of the ordinary. Parsley and thyme are always good. No halloumi on hand? Fry a couple of eggs per person in the olive oil instead, and toss the sautéed seasonings over them. No garden where you can grab some tender shoots on the way to the kitchen? Keep a bunch of Swiss chard on hand, and rather than trying to cook it all at once, put a couple of sliced leaves into multiple different dishes. Like to forage a little but didn’t find much? 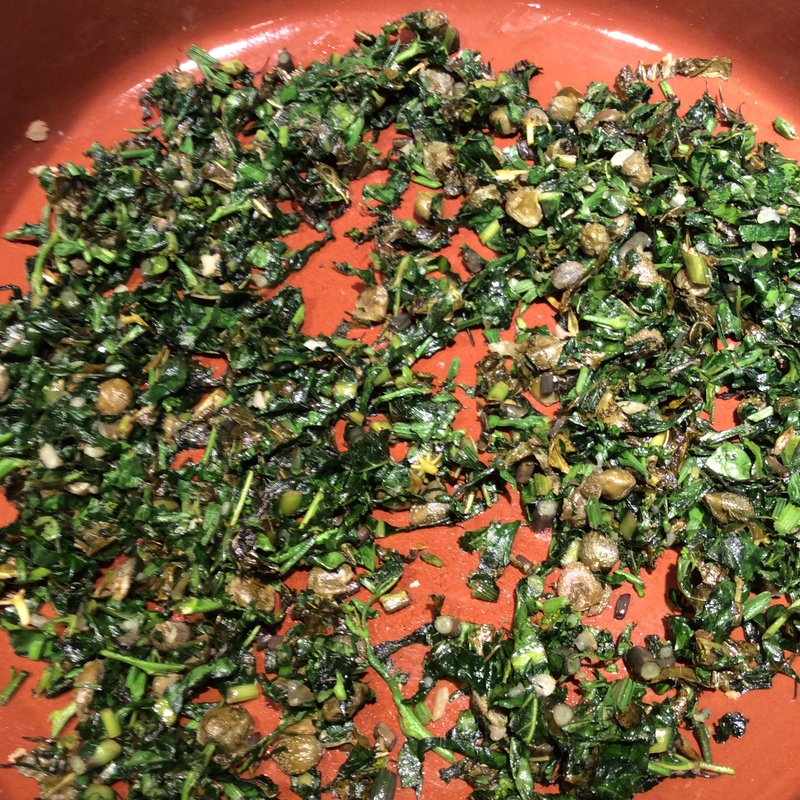 This is a perfect dish to use up a handful of dandelion or whatever other greens you found. Don’t care for greens at all? Use herbs and sliced mushrooms instead. Cooking is endlessly adaptable and can work for you, with whatever time and energy you feel able to devote to it. On my occasional staycations I have time to interact with my garden and kitchen in a leisurely way. I have time to notice things. Unfortunately, some of what I notice is at best a call to action and, at worst, a problem unfolding itself. 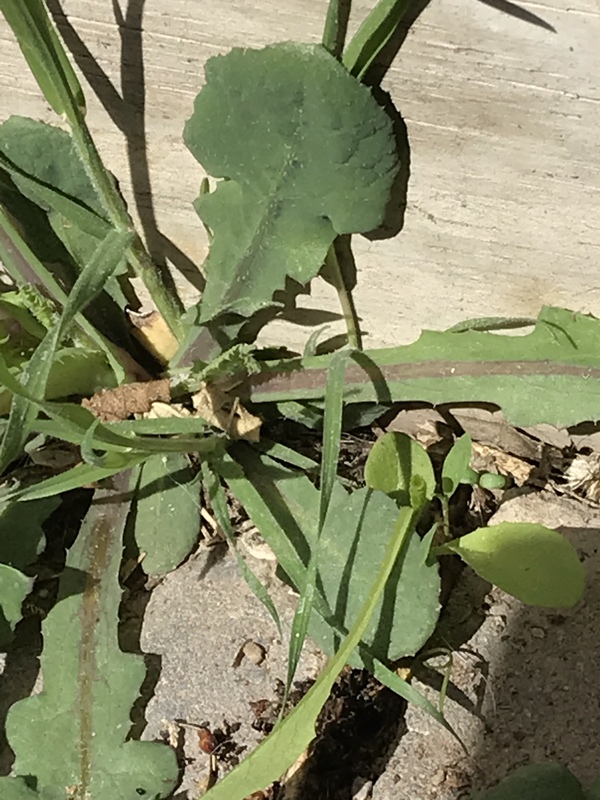 Take lambsquarters. This weed is a real nutritional powerhouse, and also is happy to take over your world if you allow it. I have written in the past about how to make it behave itself, and I do wish that I had followed my own good advice this year. But I foolishly let some plants go to bloom, which means that the leaves are scant and seeds will shower on my garden soon. 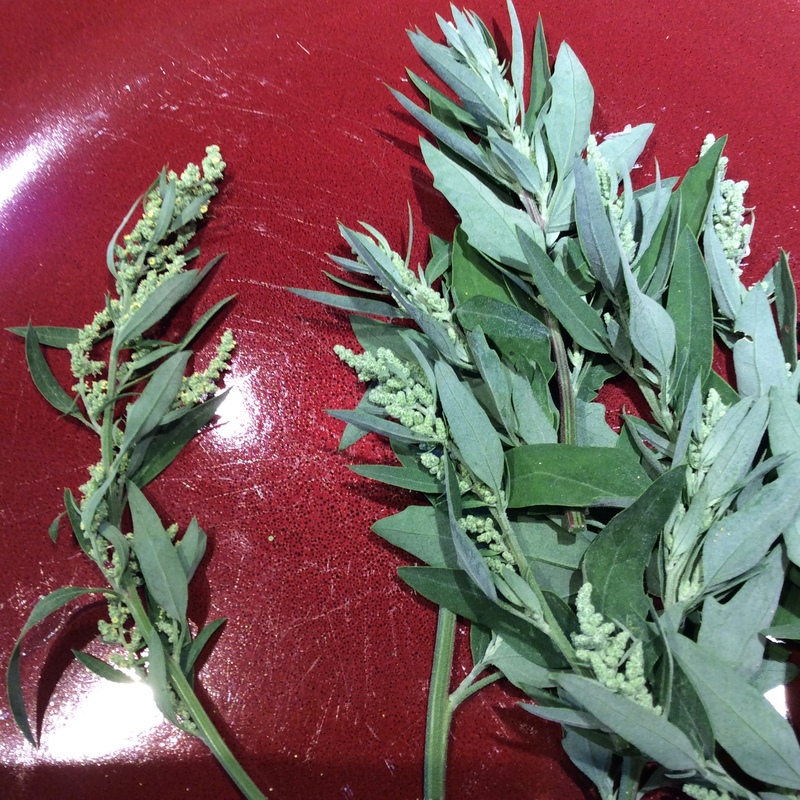 Well, all is far from lost, because Chenopodium album is still producing something edible. Notice the branch tips and you will see the clustered buds ready to pick and cook. This common weed is a true nose-to-tail vegetable. To the right above, you see tightly packed buds, perfect for cooking. The single branch to the left shows looser formation and tiny little yellow stamens, indicating that it’s gone to flower. It’s still edible at this stage but the stem is tougher. A little later the seeds start forming and, to my taste, a slight unpleasant bitterness develops and the stems get noticeably tough, so I try to eat it up before that point, but the seed clusters look a lot like the initial bud clusters. Chew a bit raw if you want to be sure. If it tastes mild and green but not bitter, and the stem can be snapped in your fingers without undue effort, it’s kitchen-ready. Steam or cook in a skillet in a little good olive oil until done to your taste, season with salt and freshly ground pepper, and eat. I steamed a batch for dinner and had some leftovers the next day, enough for one but there were two of us, which is how I came to use the cooked leftovers as the basis for a thick pesto to eat with halloumi and eggs. The lambsquarters buds are very mild, so I chose a handful of fresh dill leaves to be the dominant seasoning, and some young carrot leaves chopped finely for the bright fresh green element (my parsley didn’t do well this year.) I put a clove of garlic in the mini-prep, added 1/3 cup of olive oil and the juice of half a lemon, ground in the cooked lambsquarters buds, and then turned it into a dish and stirred in the chopped dill and carrot leaves to avoid too fine a texture. Add more olive oil or lemon juice if called for, salt and pepper to taste, and it’s ready to serve alongside nearly anything. If you don’t like dill, use something else. Only fresh herbs are appropriate for this type of vegetable-relish. After frying the halloumi in olive oil, I decided to fry an egg apiece in the remaining hot olive oil. To add a little pizazz I dropped two generous pinches of chopped dill leaves in two places in the hot skillet, then immediately broke two fresh eggs on top of them. Flip the eggs after a minute and cook to preferred doneness. Those who are only familiar with the fusty-musty dried dillweed may be surprised how much they like fresh dill in this context. I’m curious about the nutritional content of this lambsquarters-broccoli but there isn’t any available data. So I can only say that the leaves are powerfully nutritious and the buds probably are too. And wherever you may go in your life, short of prison, lambsquarters will be there. At times when I worry about the future, it’s comforting to think that if I’m ancient and beyond digging and planting, lambsquarters will grow just fine and will be on the menu as long as I can totter to the kitchen. I love Indian food and cook it frequently, and I especially love the simple dishes that make quick meals in Indian homes. This is a cuisine that vegetarians should get to know well, since the population of India is about 40% vegetarian and vegetable dishes abound. But it can seem daunting to view the ingredient list of many Indian recipes, and the toasting and grinding of spices for each dish can require more time than is available. So start with simple scrambled eggs. These are loaded with bold flavor, and easy to make. I lean low-carb so I eat them plain, but you can scoop them up with warm parathas or warmed-over naan from last night’s take-out, or pat out squash flatbread thin and use that. It’s always a good investment in your health to use the best eggs that you can lay hands on if you don’t keep your own hens. Check out the farmer’s market and get eggs from hens that have been fed a lot of greens, since bugs and leaves are a big part of the natural diet of a hen. The only out-of-the-ordinary prep that you need to do is to toast some whole cumin seeds in a dry skillet just until they are fragrant and a little darker and then grind them in a spice grinder. In the summer I do a tablespoon at a time so that I always have a bit on hand, but don’t make too much because once toasted and ground it doesn’t stay fresh for long. Be sure to add salt to the vegetables as they cook, as directed. This is part of getting them to soften properly and assures that they are seasoned through. Heat the ghee in a skillet, and add the white parts of the green onions with a good pinch of salt and sauté over medium-high heat until cooked through but not browned. Add the onion greens and the cilantro stems and another small pinch of salt and cook until the onion greens look softened; taste one to be sure that they have become pleasant to eat. Add the beaten eggs and yolks and cook, turning over with a spatula, until they are cooked to your preference. Taste for salt and add more if indicated. Add half the cilantro leaves and the toasted ground cumin to the pan and stir to distribute, serve, and top with the remaining cilantro leaves. 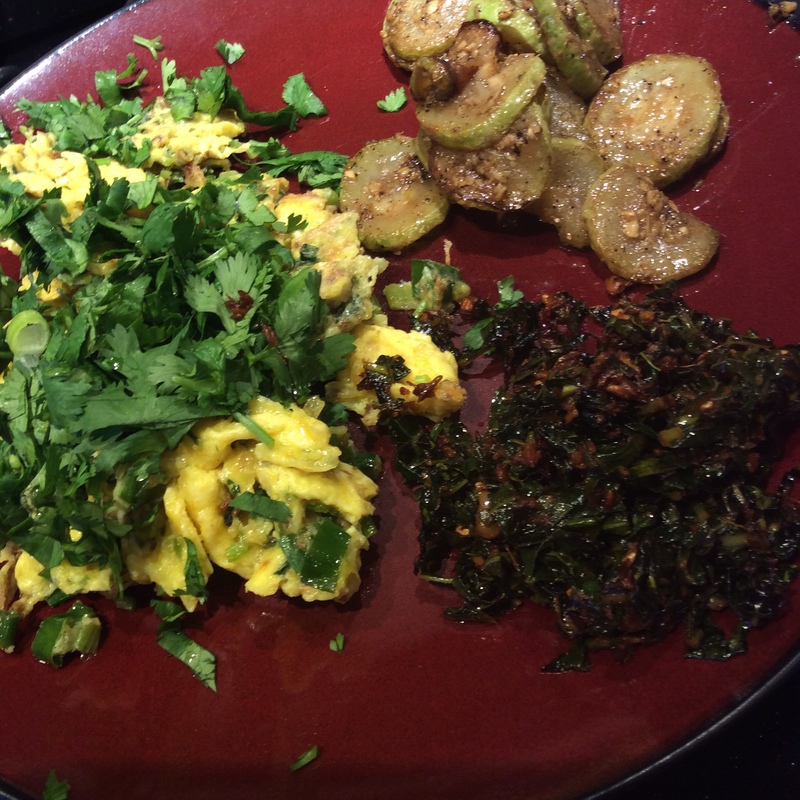 This is great as part of an Indian brunch for two as shown above, or by itself as a quick easy meal that can be on the plate in 15 minutes if you have the ingredients handy. You can also make a mini version in your smallest skillet with one big green onion, a few stalks of cilantro, and one egg, if you aren’t hungry enough for a meal but want a nutritious snack. 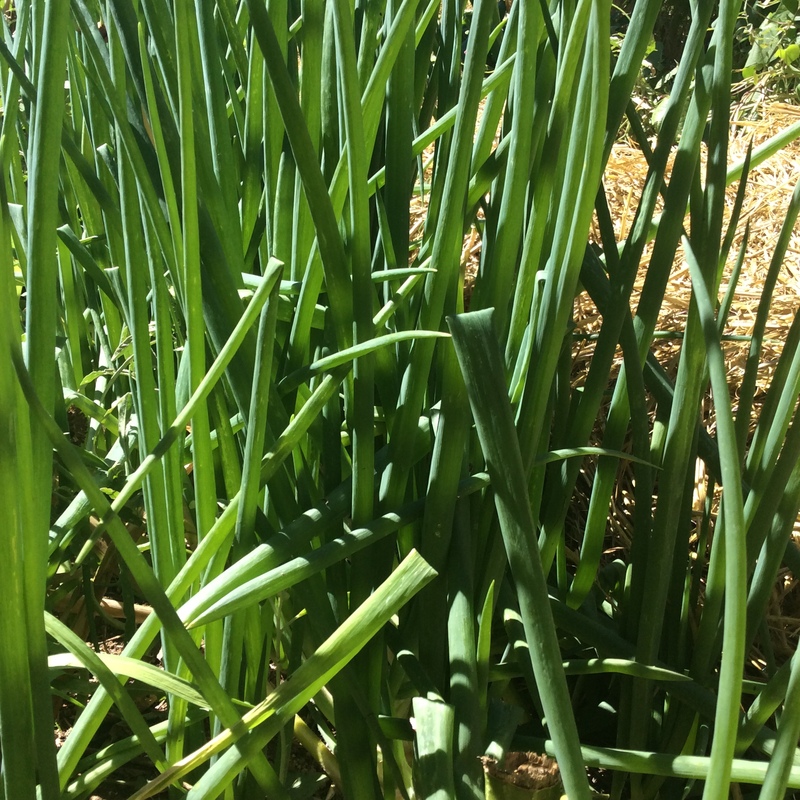 If you love green onions and want to have them around throughout the growing season, my blogging friend Luke has helped me figure out how to do it with Egyptian, or walking, onions. Once you have these sturdy onions, you have them. To get started, I ordered a hundred top-set bulbs off Etsy one fall when they were plentiful. It’s a bit of an investment by gardening standards, but it’s a one-time thing. Choose an area with good rich soil that gets plenty of sun and water. When the top set bulbs arrive, plant 20 of them and keep the rest in a cool dry place well away from direct sun, with excellent air circulation. No plastic bags. 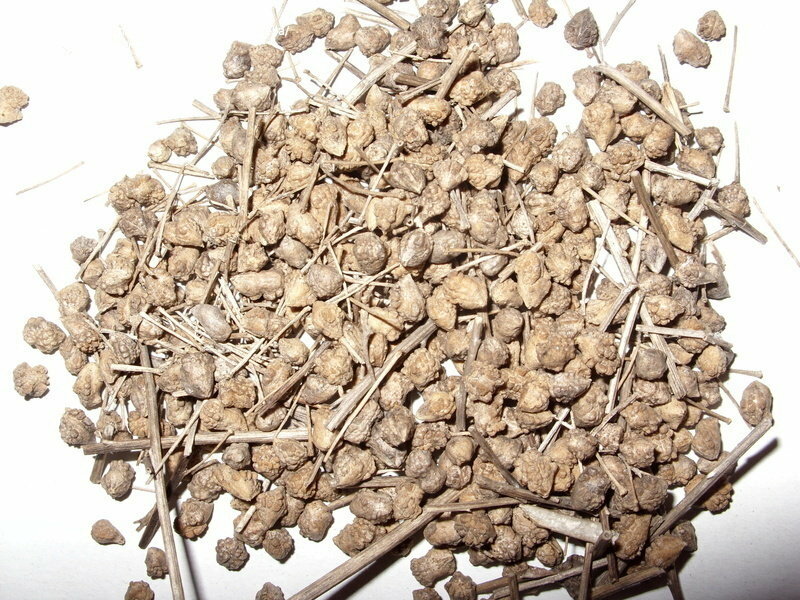 The following spring, when the ones you planted in the fall are about 6″ high, plant 20 more. Keep going in like fashion until you have succession-planted them all. If I notice the ones in the storage box sprouting, I put the box in the refrigerator until they are all planted. When the fall planting is over a foot tall, but has not yet sent up the tough inedible central stalk that forms the top bulbs, start harvesting. This is important: snap or cut them at the soil surface rather than pulling them out. The bulb and roots that you left in the ground will sprout a few new green onions for later in the year. 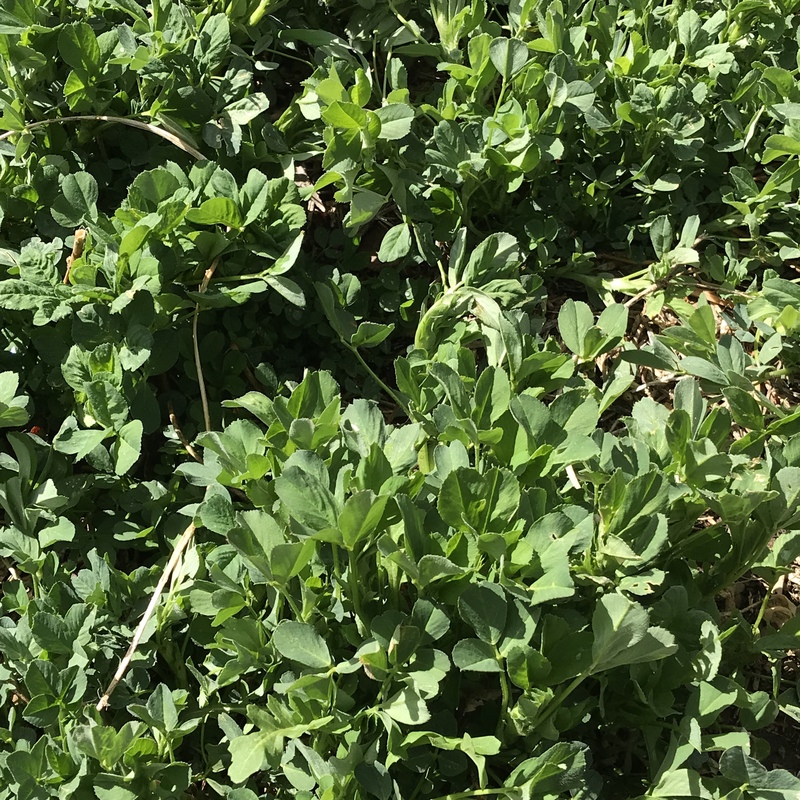 After managing your patch this way for a year, they will get so thick that they are pretty well defended against weeds and you will need to start pulling some out by the roots to prevent overcrowding. At that point, you can also start deciding when to let some go long enough to form top bulbs, and you can either start a new succession bed or give them to a friend who wants to try it. At this point I let mine perpetuate themselves from the ground and rarely let them form topsets. I keep two smaller beds, one in full sun and one in partial shade, and they yield at different times and keep a fairly good succession going with minimal input from me except harvesting and cooking. I do top-dress periodically with well-rotted goat manure and kelp meal. I’m a great believer in kelp meal, for bringing back onto the land some of the trace minerals that we washed off it into the ocean. I strongly prefer the organic Icelandic kelp meal from Thorvin, because it is harvested from an area of the ocean tested for heavy metals and some of the other nasties that we are washing into the water. I don’t want a closed system on my tiny urban farm, because any trace mineral deficiencies that existed wouldn’t get corrected. The Thorvin meal would get pretty expensive on a commercial scale, but for the small urban homesteader it’s a healthy investment. I also use it generously as a supplement for my chickens and goat. For the chickens I mix some into any moist food that they like to eat, such as any leftover cooked greens or wilted salads, and for the goat I mix it with organic blackstrap molasses to make a treat that she will trample me to get. I love the texture that feta acquires when baked, firm and compact and steak-like and very different from its crumbly fresh incarnation, and I love to season it with assortments of garden and wild greens gathered as the inspiration strikes. 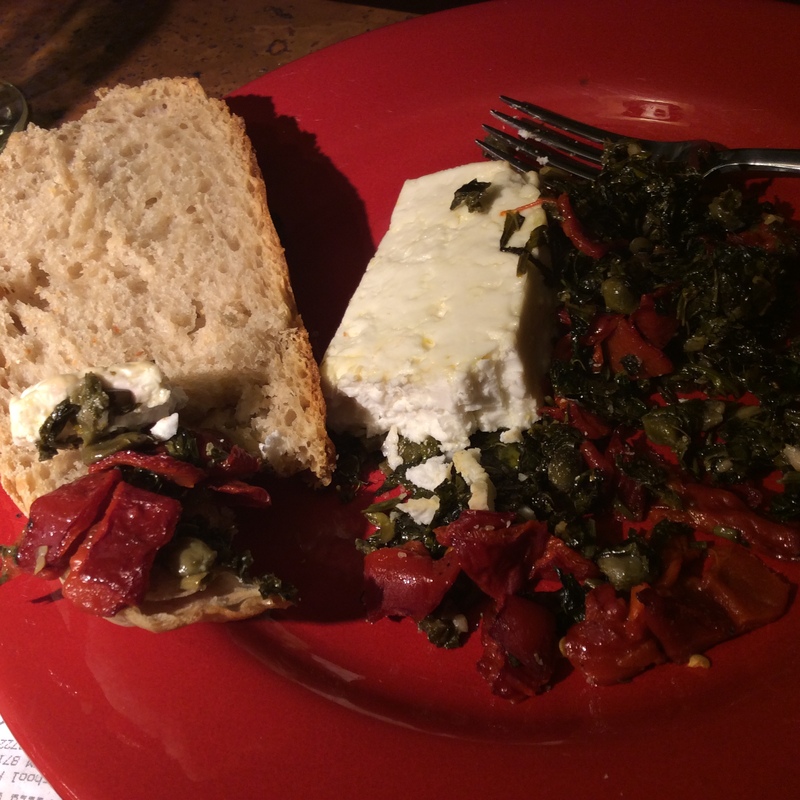 For this infinitely adaptable recipe, you will need a quarter cup of drained capers, two cloves of garlic, a quart loosely packed of very flavorful chopped greens and herbs, plenty of extra virgin olive oil, and a block of feta sized according to your appetite. This dish can be anything from a meze to a full meal, depending on the size of the feta block. Just be sure that it’s high quality; this is a good time to check out your local Middle Eastern import store. Cut two “steaks” of the desired size, being careful not to crumble them. Have ready olive oil, two cloves of garlic chopped, and a handful (maybe 1/4 cup) of capers, rinsed of brine and squeezed dry. An optional but very pretty addition is some red pepper, roasted, peeled, and chopped, or some red chiles roasted, peeled, and sliced. Next, choose your greens. 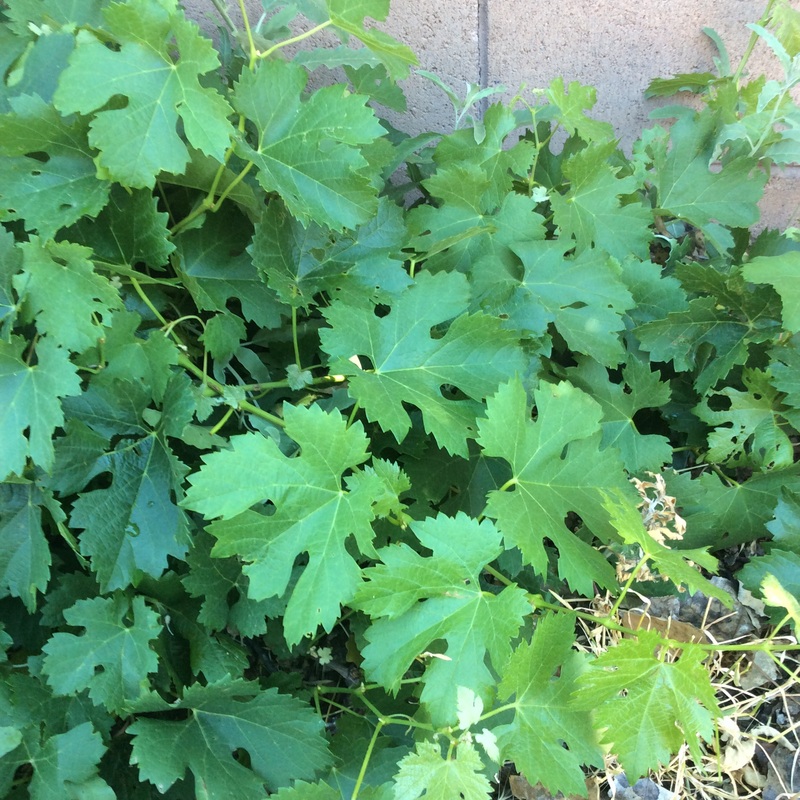 I decided that I wanted the flavor to be bright, tart, and lemony as well as herbal, so I started with 15 good-sized wine grape leaves. If you are going to use fresh grape leaves, please read my post on choosing grape leaves first, because some are unchewable and will ruin your meal. I added dandelion leaves, the new ones that have grown after the plant bloomed, which are tender and only slightly bitter. I used about a dozen, cutting the stringy ends off as shown. Then a double handful of mulberry shoots, using only the ones that are new, bright grass-green, and snap off easily with very little use of force. 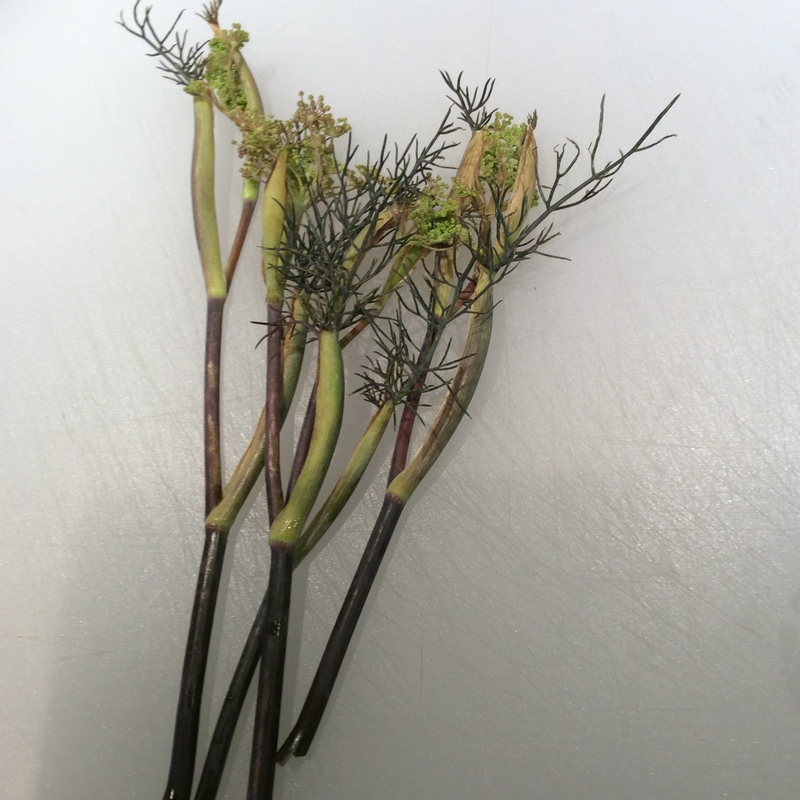 Finally, some fennel shoots, the top of the bloomscape as shown, before the flowers emerge and open. The stalks are tender, nonwoody, and wonderfully anise flavored at this stage. Once the flowers emerge, the stems become woody. Wash all your greens and sliver them in fine cross-section. make sure the fennel shoots are cut in fine slices less than a quarter inch thick. Preheat the oven to 350. You will start cooking on the stove, but if you use a Spanish cazuela it can go right into the oven for the second step. Heat the dish and sauté the garlic in olive oil until just cooked but not at all colored. 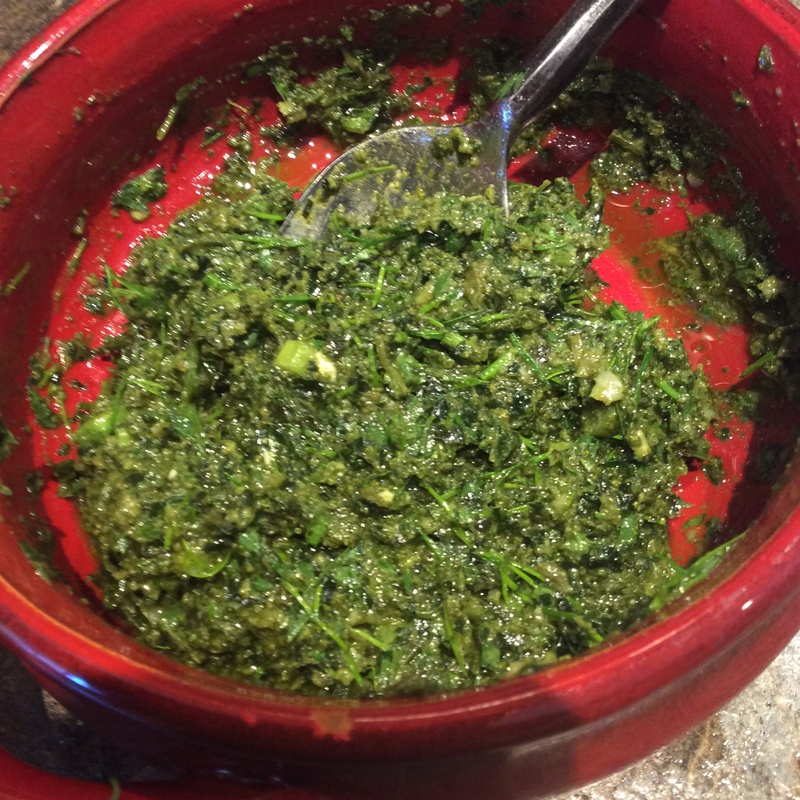 Put in all the greens and the capers and cook, stirring frequently, until the greens are cooked and soft. Taste for salt, but salt it on the light side, since you are going to add feta. 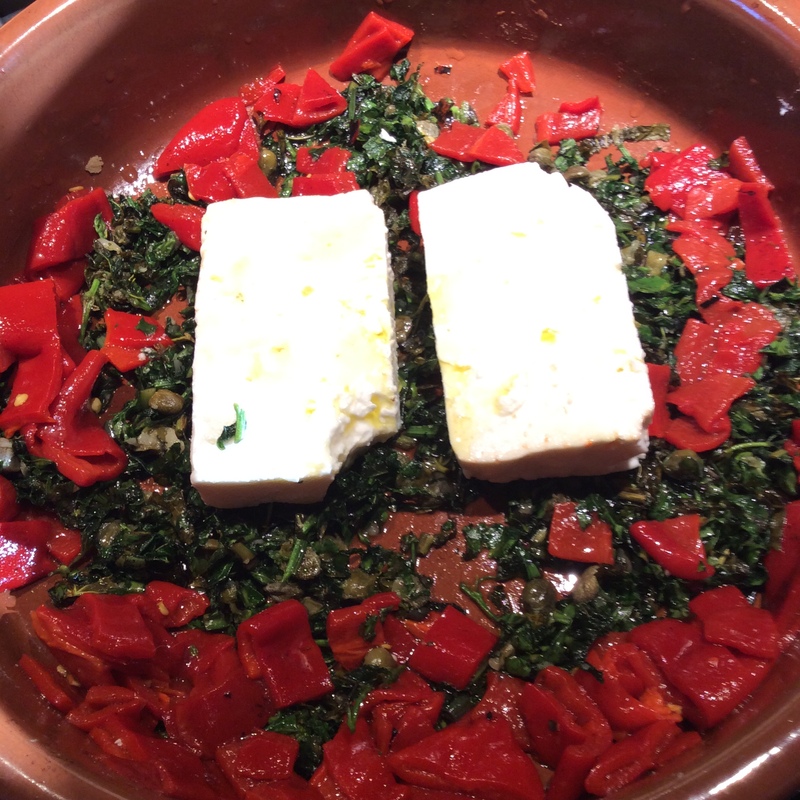 When they just begin to fry in the oil, remove from heat and scatter the red peppers or red chiles around the edges, then put the feta “steaks” in the middle and drizzle olive oil over all. Bake at least 15 minutes or until the herbs and peppers look all cooked together, probably about 15 minutes. The cheese might color slightly at the edges but won’t brown. If you like it to brown, run under a hot broiler for a minute, taking care not to let the greens burn. Serve with sourdough bread if you can have it, or with a salad alongside. I am sometimes the target (quite fairly, I might add) of complaints about imprecision. “A double handful,” the precisionists cry, what on earth is that? I reply that it’s the amount you have, and if you don’t have any, you probably have something just as good. I cut my eyeteeth on Elizabeth David recipes with her terse, one-cook-to-another directions, and I hate the mindless insistence of “precisely 1/8 teaspoon” sort of directions. “But drizzle with olive oil, how much do you mean?” Somewhere I read the story of a new wife being taught a recipe by her Greek mother-in-law, whose directions included “Then close your eyes and pour in olive oil.” That’s how much I mean. In hot weather I start to crave the food of hot climates, especially Thai food. Since I eat as few carbohydrates as possible, much of what I cook is pseudo-Thai, but it can still be delicious. Having some good condiments on hand can be a shortcut on an evening when I worked late, and my favorite Thai condiment is nam prik pao. Once I made my own according to the complex directions in David Thompson’s authoritative and addictive cookbook Thai Food, and it was the best I ever had, but it is quite an undertaking and involves deep frying a succession of ingredients before grinding them together, and deep frying is not my favorite cooking modality. Too messy. So except for special occasions, I use the fairly good bottled one from Mae Pranom. Just as a warning, this excellent Thai company makes several different condiments that all say “Thai chili paste” on the label, and are only fully and accurately labeled in Thai. So my recommendation would be to order through Importfood.com, a very good US purveyor of Thai ingredients, and get the one that they say is nam prik pao. While you’re at it, order some Shark brand Thai sriracha sauce, which is different from the Vietnamese style and can be hard to find. Besides the nam prik pao, you will need a pound of good ground meat. I used wild boar because I had some in the freezer, but ground goat, ground pork, or plain old ground beef would all be fine. The vegetable component was a pound of Oregon Giant snow peas. Any good snow pea or sugar snap pea will do. Lettuce leaves are needed for serving, and I used leaves of the hot climate celtuse-type lettuce Balady Aswan, but romaine is fine if you don’t grow your own. Other needed ingredients are a small knob of ginger, two cloves of garlic, one large or three small green onions, fish sauce, coconut cream (unsweetened) or coconut oil for cooking, sweetener of your choice, and a large handful of chopped fresh mint. 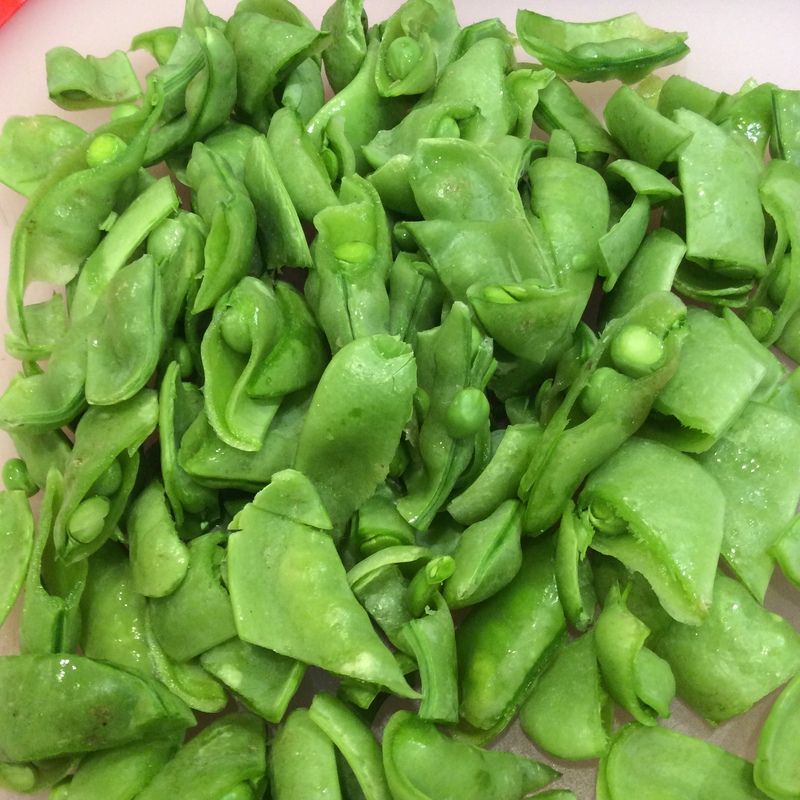 Blanch the snow peas or sugar peas in boiling water for two minutes, drain and cool in ice water, and slice diagonally. Slice the scallions diagonally, and chop the ginger, garlic, and mint. Now you’re ready to cook. 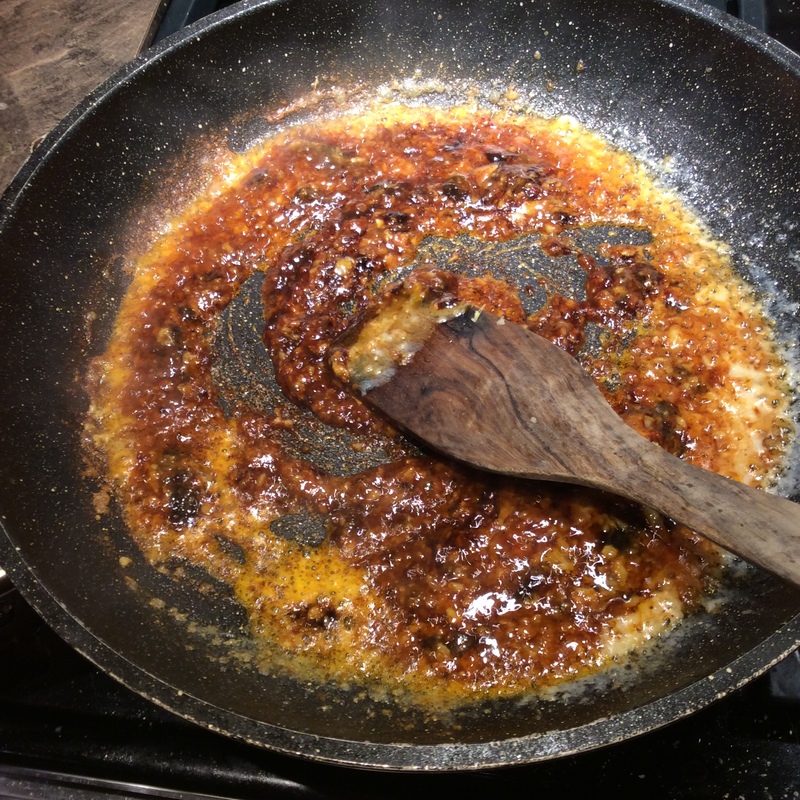 Heat a skillet or wok over high heat and boil the coconut cream hard for a minute or melt coconut oil. Stir-fry in the chopped ginger and garlic for a minute, then add 1/4 cup of nam prik pao and fry until it looks like the picture. 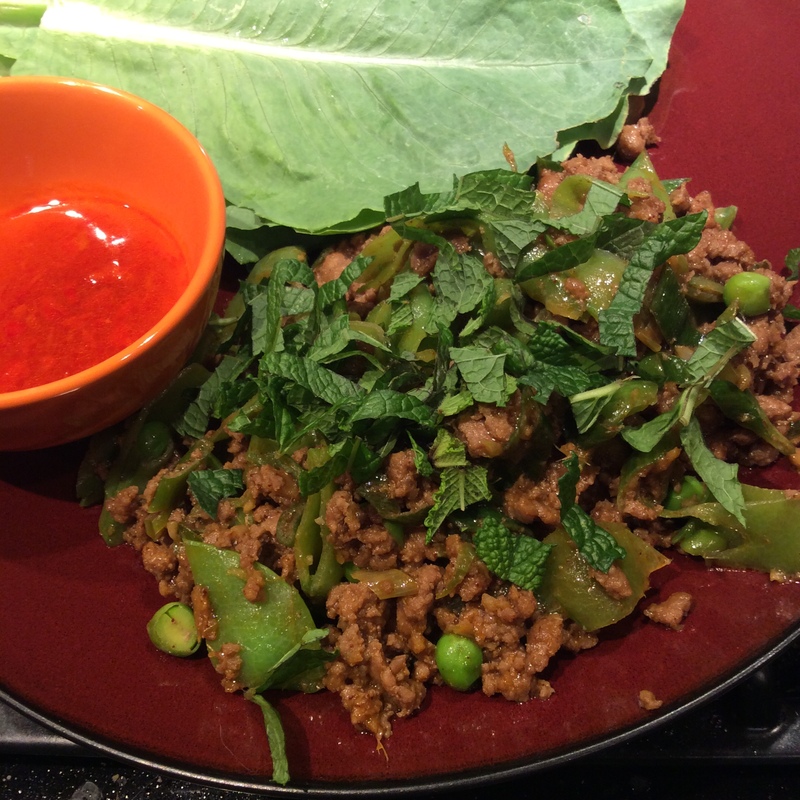 Add your ground meat now and continue to stir-fry over high heat. When it’s about half cooked, add the sliced green onions, sweetener to taste, and fish sauce to taste. I used a quick squirt of liquid sucralose and about 3 tablespoons of fish sauce. If you’re being authentic and using palm sugar, I would guess that about two tablespoons would do it. Go easy if you’re not sure, because you can adjust later. Stir-fry until the meat is completely cooked, add the blanched snow or snap peas, and cook over high heat another minute or two until they are heated through. Taste and correct the seasoning if needed. I should add that I was using my large perennial green onions, and in the hot weather this time of year they take a bit of cooking to become tender and pleasant to eat. If you are using the store-bought kind, you can add them closer to the end of the process. Know your ingredients and adapt your methods to get the best out of them. 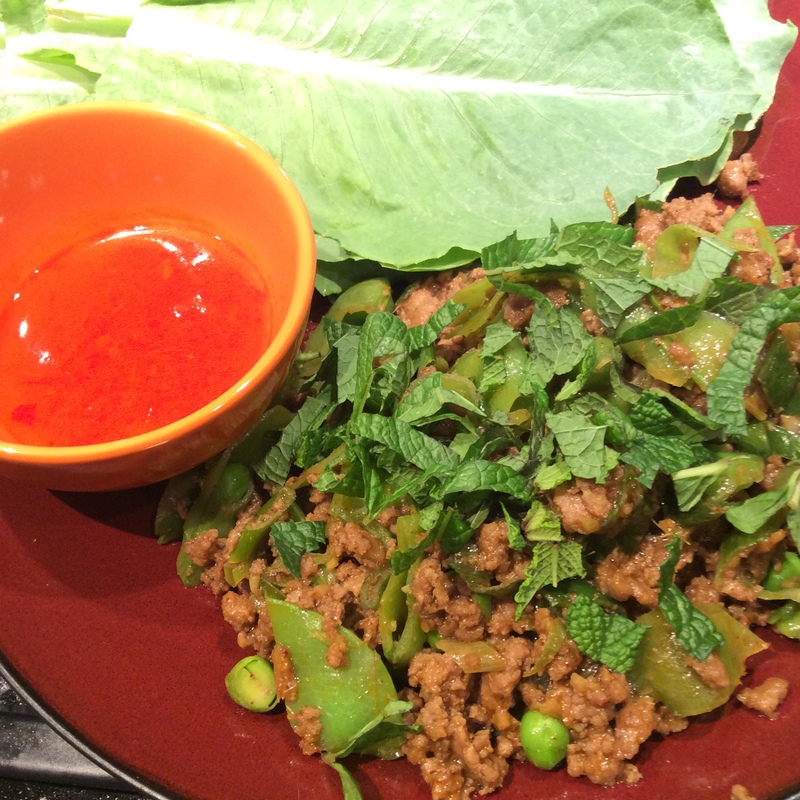 Top with chopped fresh mint just before serving and serve with stacks of lettuce leaves. I like to add a sweet-hot dipping sauce made with equal parts fish sauce and rice vinegar, artificial sweetener added until it’s pretty sweet, and sambal oelek or sriracha added until it’s pretty hot. Once you have the basic formula, the dish is endlessly accommodating. Use whatever ground meat you have, and I speculate that ground chicken or salmon might work well too. If snap or sugar peas aren’t in season, consider green beans ( be sure to blanch until tender) or greens of almost any kind. 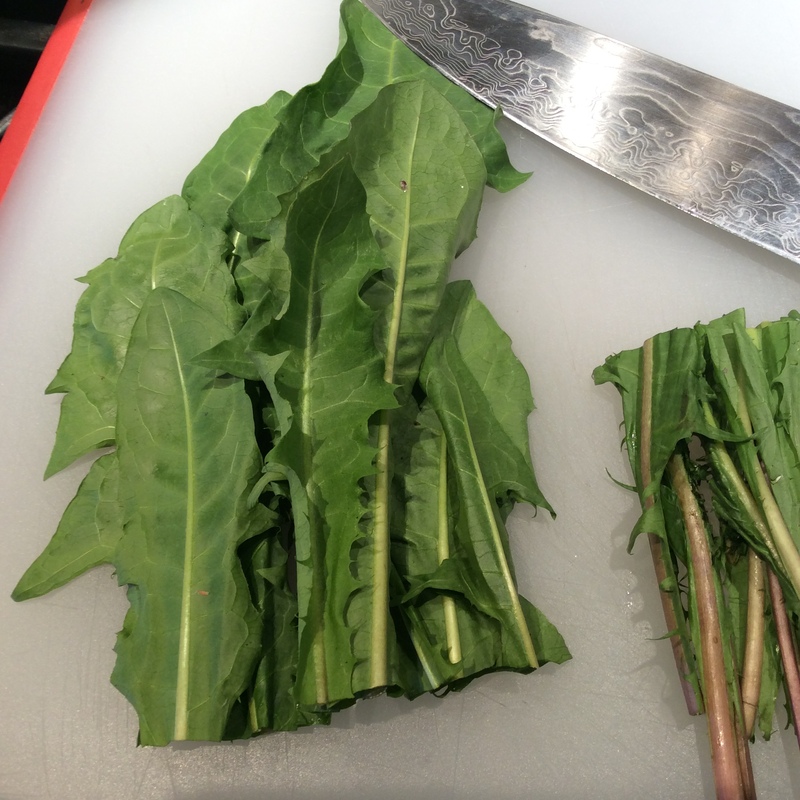 Collards could be delicious, especially if preblanched for a minute to improve tenderness. Even slightly bitter greens are worth considering, although I would reduce the quantity and not use anything more than slightly bitter. But the coconut fat and sweetening does a lot to ameliorate a small amount of bitterness. Broccoli would be delicious if blanched and then cut in small cubes to fit into the general texture of the dish. Mushrooms are another excellent possibility, and dried soaked shiitakes cut in cubes would be good but mushrooms that you grow yourself might be even better. Some mushrooms such as oysters are pretty juicy and it is worth dry sautéing them in a separate pan to get excess liquid out before adding them to the mixture. Other herbs are worth considering. Thai basil is a natural, and Italian basil is something that I would consider if I did not have Thai basil or mint handy. It just occurred to me that the licorice-sweet leaves of sweet cecily might be really good in this context, so I will be trying that. Personally I get very annoyed with finding most Thai food in America smothered in chopped peanuts, but I admit they’re delicious and they do add a good texture. If you want to explore other texture additions, a little chopped jicama or maybe even raw Jerusalem artichokes would add a sweet crunch. The hallmark of a good basic recipe is that you rapidly learn how to make it come together easily and adapt to your whim of the day and what is available in your garden. I always keep ginger, garlic, fish sauce, and some basic Thai condiments in the house, but ultimately your supply of basics may be different. If you want to announce your food as authentic Thai, then by all means read David Thompson’s cookbook and follow his lengthy and exacting directions. But if what you want is to have delicious food on your table that suits your needs and what is available in your garden, then be imaginative and don’t worry yourself overmuch about authenticity. Just pay attention to the basic logic of the flavors. As so many have discovered before me, the leaves are so strongly mustardy that they create quite an unpleasant burn in the back of the throat, and they are not a culinary object as far as I am concerned. Even my goat wouldn’t eat them. 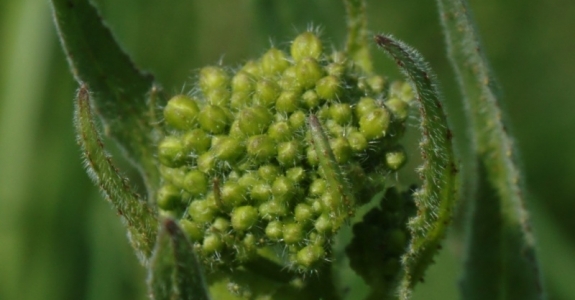 The bud clusters are used like broccoli rabe. They can be very delicious, but timing is everything. The proper stage is shown in the photo above, when each stalk has one small bud cluster and the buds themselves are green, not yet showing the edges of bright yellow petals. At this point, they can be blanched in boiling water for a minute or two, drained well, and then sautéed in olive oil with garlic and chili flakes and have the slight nutty-mustardy quality of good rabe, with no burn as you swallow. You would need several well-established plants to get enough for a few servings, as far as I can tell, but they would certainly deserve their space. Here’s a close-up of a stalk in the perfect stage for eating. Snap off the top few inches of stem with the buds and it will cook up beautifully. This picture shows the next stage in the stalk’s development. The stem has elongated and the small original cluster has spread into sub clusters. I had hoped that this would be a good stage for harvesting, since you would get more material than at earlier stages, however it was not to be. At this stage, even when cooked, there is a very unpleasant mustardy burn that continues to build in the back of the throat for a few minutes after swallowing. Not a pleasant experience. Once the subclusters have started to show and some yellow shows on the outermost buds, don’t bother. It is possible that they could be cooked longer, cooled, and ground with olive oil, salt, and maybe a little lemon into a sharp mustard-like condiment, but I have not experimented with that and throw it out as a purely theoretical idea, possibly similar to a green horseradish sauce. Because of the throat burn factor, if you choose to experiment with that idea, try it out privately before you foist it on hapless guests. 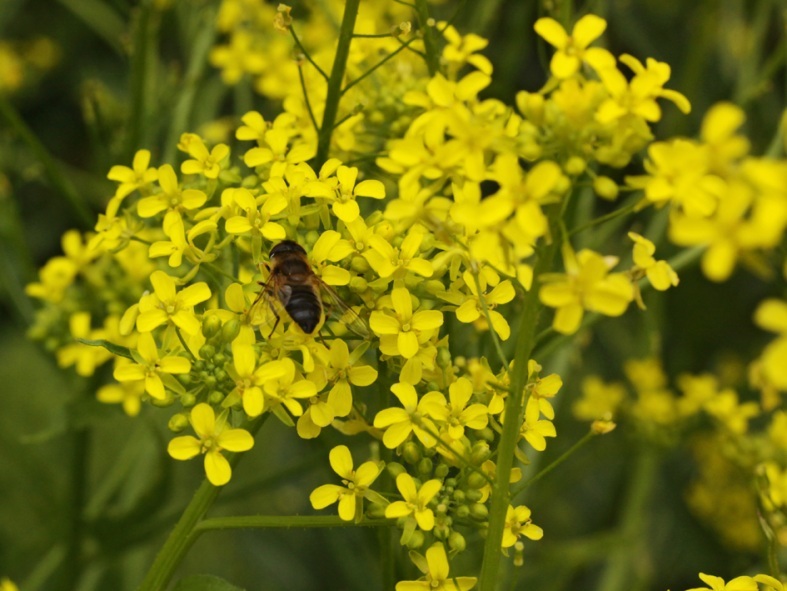 Then there is the flowering stage at which it is a bright cheerful yellow and is a fair bee plant, not highly preferred but certainly visited. This is the stage that I am waiting for, so that I can plant a whole row of it and have a lot more to cook in the future. 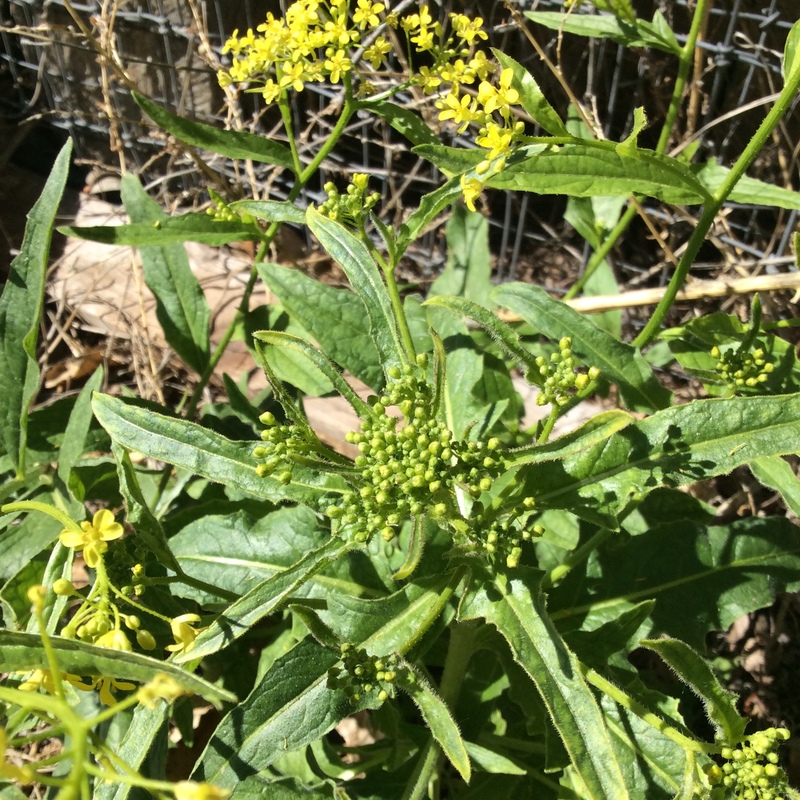 For me this perennial vegetable fills a good niche after the winter broccoli is gone, but before the spring broccoli begins producing. This time of year there are a lot of edible leaves in my garden but not too much else, so some textural variation is very welcome. 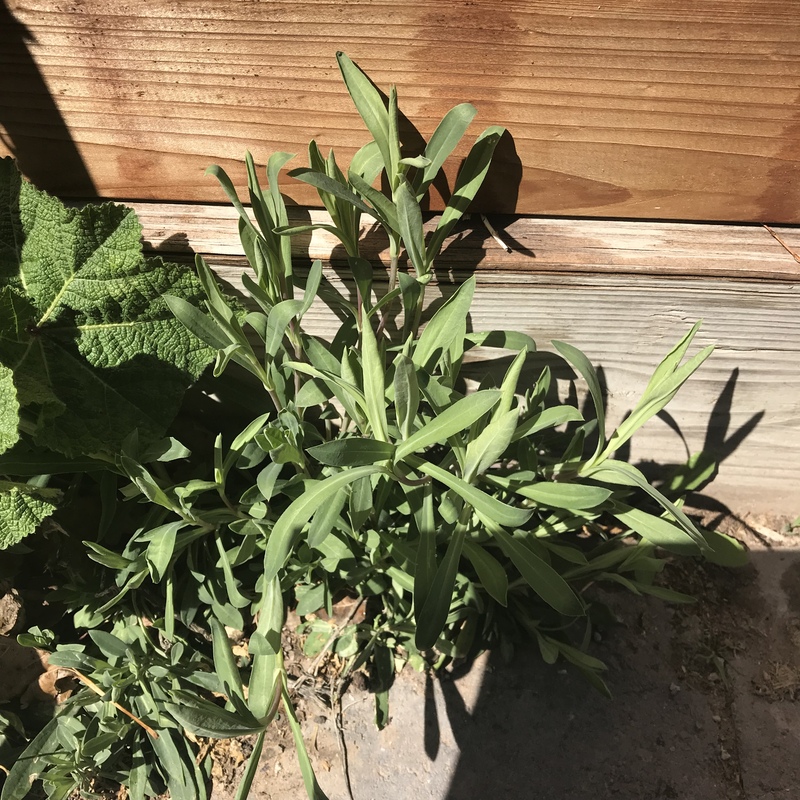 Regarding the claims of invasiveness, I am sure that this is true in many areas, but in my desert climate it requires a fair amount of water to grow well, so I doubt that it could grow outside the confines of my fence.